Katherine's debut album with Chandos explores the relationship between the human voice and the flute. "My concept behind the disc is to show how close to the human voice the flute can be, and how, through the sound, I can convey the character and sentiments of the arias, pushing the boundaries of what the flute can do as a solo instrument. I hope you enjoy the 'singing' beauty of my flute." For her third recording on the Linn label, Katherine has chosen a selection of familiar pieces for the violin and adapted them for the flute. "My reason for recording this selection of repertoire is a desire to offer a new perspective on familiar compositions. Today the modern flute is able to transport its listeners through many emotions, evoking many sound colours and nuances, and is capable of speaking above an orchestra. I feel that primarily, I am a musician rather than a flautist, and most importantly, I see my instrument simply as a vehicle through which to interpret music. I recognise that every instrument has different characteristics and will inevitably reveal different facets of a piece. It is for theses reasons that I offer you this recording, hoping it will present a fresh view on some much loved works." 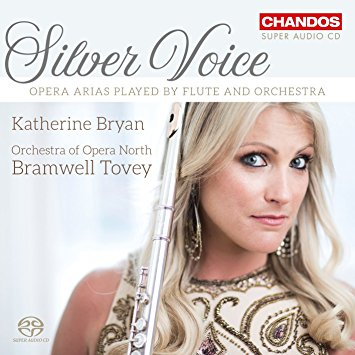 Young flautist Katherine Bryan is rapidly confirming her place as one of Britain's bright musical stars of the future. For her recital debut the in-demand concerto soloist performs a selection of 20th century concertos, including the rarely recorded Liebermann Concerto for Flute and Orchestra. "It has been a great pleasure for me to have recorded these four special pieces. The Nielsen concerto will always feel very personal to me after winning a national competition with a performance of it when I was a teenager. The Hue and Poulenc are both pieces I love and have played many times in recital with piano, so to play them in their orchestral versions has brought a new and exciting dimension. I feel that Lowell Liebermann's concerto encompasses all the emotions and colours of which the flute is so brilliantly capable and it is for me, quite simply a 20th century virtuoso masterpiece, and thrilling to play. I hope you enjoy this disc as much as I did recording it." Following on from the success of her debut disc Liebermann Flute Concerto, Katherine released a second album on 20th May featuring works by Ibert and Martin, Debussy and Rouse. The album enjoyed a successful launch at National Geographic London Store in Knightsbridge preceding the release. The choice of works mirrors Katherine?s love of American works: a passion ignited by her studies at the Juilliard School in New York. Notably, this disc features the first UK recording of the Rouse Concerto, a five-movement work composed in 1993 by Christopher Rouse. ?The Rouse Concerto is an incredibly powerful piece of music?the first and last movements evoke the traditions of Celtic folk music and are incredibly spiritual. The third movement was written in response to the tragic killing of young James Bulger. Also, the concerto was written for my teacher at Juilliard, Carol Wincenc, so I have always felt a strong connection to the piece, and it is a realization of a long-harboured aspiration to have finally recorded it.? 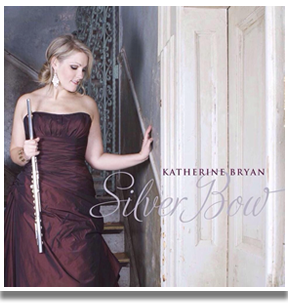 Katherine's Debut Album is also available for online purchase, in CD and digital download formats.